Stress in the MENA Workplace, Bayt.com, the Middle East’s job site, investigates the various factors that contribute to stress in workplaces across the MENA region. The stress we experience comes from our personal lives, sometimes, a person’s stress can be caused by, or made worse, by work. The poll has revealed that more than half of respondents in the Middle East and North Africa (MENA) region agree that workplaces today are more stressful than they were a few years back (52 per cent), and more than two thirds (69.1 per cent) agree that they feel more pressure at work this year in comparison to last year. The majority of respondents feel overwhelmed at work (83 per cent), with 26.2 per cent feeling overwhelmed ‘all of the time’, and 74.8 per cent claiming that jobs at their companies are more demanding than others. More than a third, or 35 per cent, claim to spend too much time at work, while a quarter say that they spend just the right amount of time. Just 2.9 per cent admit that they are spending too little time at work. According to MENA respondents, stress does not affect work performance the most. For them, stress affects their family relations the most, with 27.9 per cent of the respondents saying so. This is followed by their friendships (21 per cent), work performance (19.9 per cent) and health (16.4 per cent). The three main stress factors for MENA respondents are their financial situation (40 per cent), their work (19 per cent) and their personal issues (18 per cent). While almost a quarter of respondents, or 24.7 per cent, claim to experience an average amount of stress at work, 57.4 per cent of them find the workplace stressful; with 17.6 per cent admitting that their workplace is ‘extremely stressful’ and 19.7 per cent claiming to experience ‘a little stress at work’. Meanwhile, 18 per cent of the respondents claim that their workplace is not stressful at all. Low salaries: A low salary is the main stress factor at work for 28.2 per cent of MENA respondents. 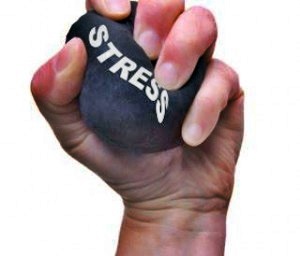 Other stress factors include a lack of job security (12.3 per cent), while 9.7 per cent say it’s the workplace environment and not having a work-life balance (9.1 per cent). In addition, 40 per cent of the respondents claim that technologies, like email, laptops and phones, intended to make their lives easier, are actually contributing to work stress; 42.1 per cent believe the opposite to be true. When it comes to avoiding work stress altogether, a quarter of the respondents or 25 per cent agree that engaging in regular team meetings and working for a company that offers flexible hours (23.9 per cent) will reduce the stress component. In fact, more than three quarters claim that they could do a much better job if given more time (77.4 per cent). Over two thirds of the respondents or 67.9 per cent admit that they can express their thoughts or complain about their workload, and the majority receive adequate acknowledgment and appreciation when their work is good (82.7 per cent). Moreover, 92.2 per cent have adequate control, or input, over their work duties, and almost three quarters or 73.6 per cent agree that the management is sufficiently sensitive to, and helpful, in resolving needs, conflicts, or other problems that are stressful for employees. To resolve their stress issues, 43.6 per cent of respondents exercise more frequently, while 39.7 per cent turn to socialising with friends after work. “Work-related stress can be caused by poor work organisation, poor work design, unsatisfactory working conditions, low salaries, and lack of support from colleagues and managers,” said Suhail Masri, Vice President of Employer Solutions at Bayt.com. Data for the Bayt.com ‘Stress in the MENA Workplace’ poll was collected online from June 26, 2016 to August 2, 2016. Results are based on a sample of 10,956 respondents. Countries that participated include the UAE, Bahrain, Algeria, Egypt, Iraq, Jordan, Kuwait, Lebanon, Morocco, Oman, Tunisia, Qatar, Saudi Arabia, and Yemen.